The book contains over 220 pages and is available to buy Amazon for $19.66. You can also download the full book as PDF (or Word)... it’s free to share & remix & do fun stuff with. Thanks to the great work of you guys there is a Chinese translation effort available at 55fun.cn (there are already different Chinese versions), as well as two English HTML versions (some of these projects are works in progress). Contact me if you also have a conversion or translation online. 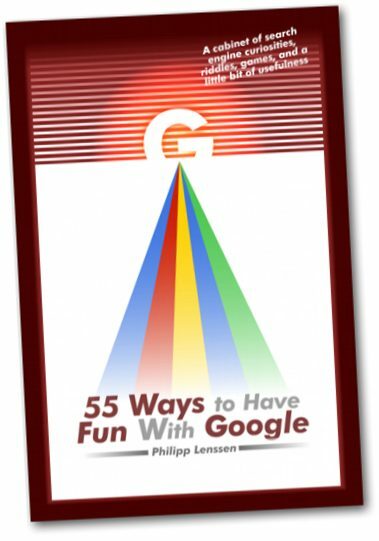 What is Google, and what do people consider fun about it? The Google Quiz: How Much Do You Know About Google? Special thanks to Mark Draughn, Iolaire McFadden and Miel Van Opstal for helping out with the book. You can post your feedback in the Google Blogoscoped forum or on the Lulu page. Bonus link: Make Google logo black and white!